Some doctors believe that medicine is entering a new phase in which cells will become living drugs. It is being called a third pillar of pharmaceutical medicine. “We are at the precipice of a revolution in cancer treatment based on using immunotherapy,” writes Dr. Stanley Riddell. Immune therapy works because an enhanced immune system has the ability to take cancer down. However, the type of immune therapy the pharmaceutical companies and most oncologists support is an absurd joke—with costs reaching upwards of a million dollars a year. Fortunately, we can employee immune therapy for cancer patients without the use of expensive pharmaceuticals, meaning we can reduce the cost by almost a thousand fold and probably have better success when we switch to non-pharmaceutical means. Nivolumab costs $28.78 per mg of drug, whereas ipilimumab costs $157.46 per mg. “To put that into perspective, that’s approximately 4000 times the cost of gold,” commented Leonard Saltz, MD, from Memorial Sloan Kettering Cancer Center, New York City. It is an idea as dangerous as it is powerful. A sign of how potent the T-cell treatments are is that most patients suffer from “cytokine release syndrome,” a storm of molecules generated as the cells fight the cancer. At least seven patients have been killed by the syndrome. Another reason that the therapy is dangerous is that few antigens appear exclusively in cancer cells. In 2009, a woman given T cells engineered to recognize colon cancer suddenly went into respiratory distress; she died five days later. Doctors at the National Cancer Institute quickly canceled the study, concluding that the T cells had encountered their antigen in her lungs and attacked. Dangerous and permanency aside recent advances in an immune-cell cancer treatment, the type of immunotherapy using engineered immune cells to target specific molecules on cancer cells is producing dramatic results for people with cancer, according to Dr. Riddell proving that the immune system, when stimulated, has the power to reduce and remove cancer from the body. “When a person is infected with a virus, their immune system starts to create antibodies to attack it. If the person is strong enough and their body sustains that strength long enough, their immune system can eventually neutralize and clear the virus on its own,” says Time Magazine. The same can be said of cancer but the immune system needs a lot of help to do so. We found out with the Ebola epidemic that approximately 50% lived through it even when they were not receiving medical care again proving that in a good percentage of people the immune system is powerful enough to come to the rescue. In the case of cancer, doctors now know that the immune system can be manipulated to fight harder. What they do not know is that this can be done through natural means that are far safer and fantastically less expensive than pharmaceutical approaches. Intelligent protocols of medicinals already exist that lend greater strength to the immune system without employing toxic medicines. Iodine is a case in point. The body’s ability to resist infection and disease is hindered by long-term deficiency in essential vitamins and minerals. Importantly poor immune response is correlated with impaired thyroid function; a deficiency in iodine can greatly affect the immune system primarily because low levels of iodine lead to problems with the thyroid gland. In sufficient amounts iodine can not only adjust a dysfunctional thyroid, it can assist with a host of glandular imbalances as well as kill a wide assortment of internal as well as external bacteria, fungi, and virus’s. Iodine has many non-endocrine biologic effects, including the role it plays in the physiology of the inflammatory response. Iodides increase the movement of granulocytes into areas of inflammation and improve the phagocytosis of bacteria by granulocytes and the ability of granulocytes to kill bacteria. “At 6 grams daily (which is 6 million micrograms/day or 6,000 milligrams/day! ), a much higher dose, iodine has been used to cure syphilis, skin lesions, and chronic lung disease,” says Dr. Gabriel Cousens. “From a larger physiological perspective, it is important to realize that the thyroid is only one gland of many glands and tissues that needs iodine. Other glands/organs/systems with high iodine uptake are the breasts, ovaries, cervix, blood, lymph, bones, gastric mucosal, salivary, adrenal, prostate, colon, thymus, lungs, bladder, kidney, and skin. Iodine is found and used in every hormonal receptor in the body,” he states. Though no one alive today uses such high dosages cancer patients should take notice and not be shy about how much iodine they should take. The easiest, safest and most effective way of increasing immune system response is to increase body temperature withinfrared therapy. 98,6° F is the natural operating temperature for most people. Immune system function, vitality and metabolism decrease with temperature loss about 50-70%. The lack of warmth often appears with cold hands and feet, but also with the chronic cold illnesses: Depressions, Burnout, tiredness, arthrosis, impotence, Parkinson’s, MS and dementia as well as many other diseases. Cancer tumors grow faster when the body temperature is low. Low body temperature invites cancer because of the lowered ability of the immune system to clear the body of cancer cells. Our immune cells are designed to protect us, but what protects the immune cell? Glutathione is the protector of the immune cell and allows newly formed immune cells to proliferate to attack germs and viruses. Glutathione feeds, protects, and strengthens our immune system. Selenium is a potent immune stimulator. An 18-month study of 262 patients with AIDS that found those who took a daily capsule containing 200 micrograms of selenium ended up with lower levels of the AIDS virus and more health-giving CD4 immune system cells in their bloodstreams than those taking a dummy pill. These AIDS patients who took selenium were able to suppress the deadly virus in their bodies and boost their fragile immune systems. Selenium-deficient lymphocytes are less able to proliferate in response to mitogen, and in macrophages, leukotriene B4 synthesis, which is essential for neutrophil chemotaxis, is impaired by this deficiency. These processes can be improved by selenium supplementation, especially when using Dr. Emanuel Revici’s type of selenium. A person’s entire immune system can be rejuvenated by fasting for as little as three days as it triggers the body to start producing new white blood cells, a study suggests. Fasting for as little as three days can regenerate the entire immune system, even in the elderly, scientists have found in a breakthrough described as “remarkable.” Although fasting diets have been criticized by nutritionists for being unhealthy, new research suggests starving the body kick-starts stem cells into producing new white blood cells, which fight off infection. Dr. Valter Longo, a professor of biological sciences at the University of Southern California. One of Longo’s recent experiments involved a small group of people who fasted for five consecutive days once a month, three months in a row. Among the study participants, markers of cell regeneration increased, while risk factors for diabetes, cancer, cardiovascular disease, and aging all dropped, he says. Dr. Luigi Fontana, a professor of nutritional science at Washington University in St. Louis and Italy’s University of Brescia says when you go long periods without food, the resulting metabolic changes appear to stimulate “autophagy,” or a natural cleaning out of your body’s damaged cells. “Cells start to eat dysfunctional proteins, organelles, and mitochondria, and this kind of cleaning of garbage and regeneration may be very beneficial,” he explains. Juice fasting has been a favorite of many to pack in super nutrition while in fasting mode. A new way of doing this is with liquefied seeds. Obviously, the immune system will respond to heightening the intake of nutrition especially when done with foods that are easy to digest, which they are when administered in liquid form. The immune system is extremely vulnerable to stress, emotional and mental upset, as it is to changes in the environment, to radiation, chemical and heavy metal exposure, as well as to cold and damp. However, it is our inner levels of emotional and mental conflicts that inflicts constant damage and challenges to our immune system. Thuschanges in breathing, for instance, can have interesting positive consequences on immune function because such changes help us calm and center ourselves bringing harmony and balance back to our inner worlds. Meditation, prayer and the use of affirmations is also helpful as well as getting in touch with the vulnerable feelings hidden in the heart. 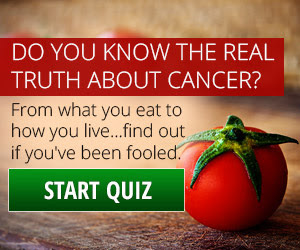 Learn more by watching The Truth About Cancer documentary series.